I absolutely love Rome at Christmas time. The city is all lit up and decorated, there are wonderful things to eat (always a priority with me), and it's a great time to see Rome in an entirely different light - literally. Christmas Market in Piazza Navona in Rome in 2018 is here. It's been several years that the Christmas market situation in Piazza Navona has been a bit iffy. Ever since a big scandal in 2014 reduced the market to minuscule proportions, there HAS ALWAYS been some semblance of a market in Piazza Navona. So there is a market, carousel, nativity scene, and live puppet show (several times a day). While it's much reduced from previous years, when it resembled a Christmas Market you would be more likely to find in Northern European countries, it's still lively and festive. It will stay up until January 6, 2019. You can visit the market stands daily from 10am. Monday - Friday they will close at 1am, and on the weekend, they will stay open until 2am. The Christmas Market and Fair in Piazza Navona in 2014, when a controversy and scandal caused the fair to reduce its proportions drastically. This is now more or less what it looks like each year since then. Is everything closed in Rome on Christmas? What can I do on Christmas Day in Rome? Where can I eat on Christmas Eve and Christmas Day? Is Rome crowded at Christmas? When do they light the tree at the Vatican? Are there Christmas Markets in Rome? Where are they and what are they like? What's the weather like in Rome at Christmas time? How can I get tickets to midnight mass at the Vatican? How can I see the pope during Christmas? Will you be in Rome for Christmas? Are you worried that a lot is closed? The city is quite alive and only a few places close on Christmas Eve and/or Christmas Day, but there is still plenty to do and you will not be without a place to eat. The Christmas holiday season in Rome starts on December 8, which is the holiday of the Immaculate Conception, or Immacolata. The season officially ends on January 6, the Epiphany. This day is called the Befana in Italy. The word Befana is not a direct translation from the word Epiphany. In Italy, the Befana is a good, although not pretty, witch that flies around and brings gifts to children on the night of the 5th of January, celebrating the Day of the Kings, or Epiphany. Most of the major sites and monuments that have entry tickets, including the Colosseum, Forum, and Borghese Gallery, are closed on Christmas Day and New Years Day. They will, however, all be open on the 26th, despite that day also being a holiday. The 26th of December is an excellent time to visit these sites. They will be much less crowded than usual. Saint Peter's Basilica is open daily for visits and normally scheduled masses. The basilica opens at 7am and closes at 6:30pm. See below for more information about midnight mass at the Vatican. Many shops have extended hours from early November through the 6th of January, i.e. opening on Sundays or staying open through lunch when they don't normally. However, most shops will be closed by 6pm on Christmas Eve, and shops in Rome will be closed on both the December 25th and 26th. December 26th is Santo Stefano, another religious holiday, which is why banks, offices and shops are closed. But Italians start chomping at the bit by the afternoon of the 25th and from then, and all during the 26th, you will see large swaths of Italians strolling the city center, gazing longingly at the shop windows. Shopping sales (saldi) are held twice a year, the dates of which are government regulated. Sales are held once in summer and once in winter. In Rome, winter sales begin sometime the first week in January. Click here for more about Shopping Sales in Rome. TIP! Do you really need to shop on December 25th? Termini train station has many shops, restaurants, a few pharmacies and a grocery store. They are (almost) all open on Christmas Day! Most Rome restaurants are open normally throughout the holiday season but may close for Christmas Eve, sometimes Christmas day (although many are open for Christmas day lunch, which is popular among Italians today), and particularly Christmas day evening. Most Rome restaurants stay open for New Years' Eve, offering a special New Years Eve menu (cenone, or big dinner), at a set price. Alternatively, some restaurants will offer an "a la carte" menu for Christmas and/or New Years, except that the menu will not be their usual one, and the prices will be higher. Some Rome restaurants close for New Years day, either for lunch or the entire day. So then, what CAN you do on Christmas day in Rome? So now that I've told you about all the things that are closed, you may be wondering what to do on Christmas Day in Rome. Walk around the city center, soaking up the lights and atmosphere, from via Veneto to via del Corso. Head to Piazza Navona and enjoy the piazza's special look and feel this time of year. Even if there is not the same huge Christmas market there as in years past, it's still a festive atmosphere. This is especially nice if you have kids, as there might be games, a Santa, a carousel, and some lights. Take the bus to the Gianicolo hill and get a bird's eye view of Rome from there. There is another carousel here for kids, too. Visit any number of churches and see the presepi, or Nativity Scenes. Go to St. Peter's Square at the Vatican at noon, and watch Pope Francis give his Christmas Day Urbi et Orbi speech. The Pope appears at the loggia of St. Peter's Basilica and blesses the crowd. (He only does this one other time each year, at Easter.) You don't need tickets but expect large crowds. Have a big Roman Christmas lunch out at a restaurant. See a concert at Rome's Auditorium. On December 25, 2018 at 6pm, there will be a Gospel Festival, how fun! Click here to book your morning tour with Viator (US$) or GetYourGuide (other currencies). Besides the above concert on Christmas Day, there are a few other concerts in Rome around this time that will get you into the holiday spirit! Catch Disney on Ice in Rome this December 6-9, 2018, at Palalottomatica in EUR. Tickets from 29€. Matinees available. Take in a wonderful Christmas concert in the gorgeous basilica of Sant'Agnese in Agone, right on Piazza Navona. For a unique and solemn experience, attend the Christmas Baroque Concert inside Rome's Capuchin Crypt. December 21 and 28, 2018. From $40. Listen to a Christmas concert with a variety of holiday songs, from opera arias to classics like White Christmas and Jingle Bells, in a lovely church in the center of Rome. Enjoy a light aperitivo of snacks and sparkling wine after the show, together with the artists. December 22 and 26, 2018. From $35. 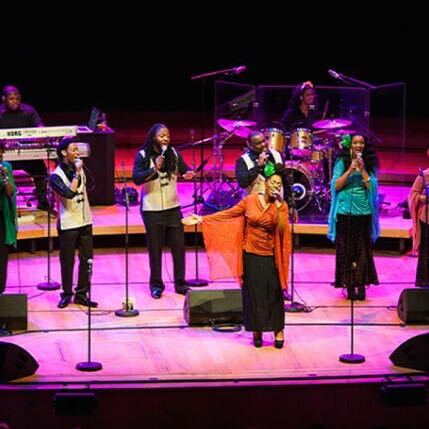 Check out the Rome Gospel Festival at the Rome Auditorium. There will be a special Christmas Day concert by the New Direction Tennessee State Gospel. 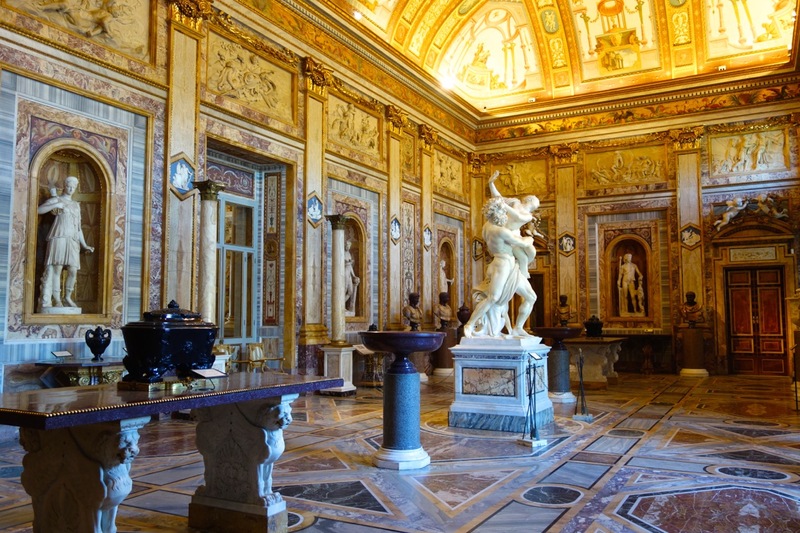 Italian state museums and sites, like the Colosseum, Galleria Borghese and Castel Sant'Angelo; and Rome museums, such as the Capitoline Museums are all closed Christmas Day (but open the 26th.) They also have shorter hours on the 24th, so check before you go. Andy Warhol at the Complesso del Vittoriano. Now through February 3rd, 2019. 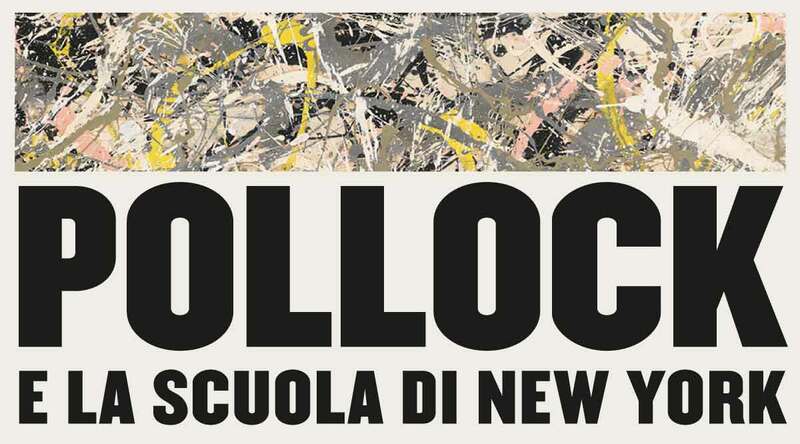 Pollock and the school of New York at the Complesso del Vittoriano. Now through February 24th, 2019. 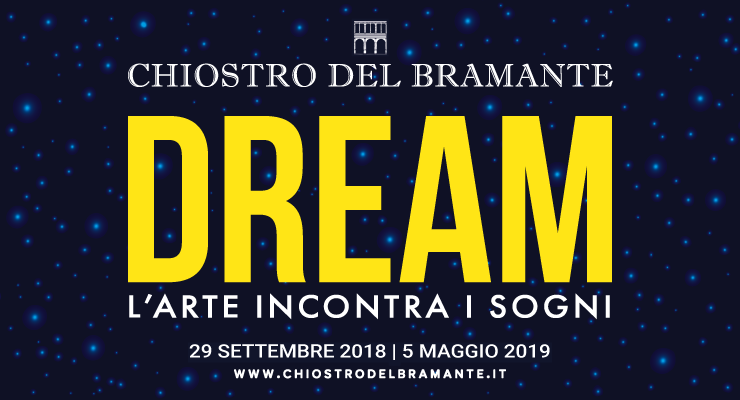 Dream - Art Meets Dreams - at the beautiful Chiostro del Bramante, now through May 2019. Click the picture to visit the museum's official site. The Chiostro del Bramante is open Mon - Fri from 10am - 8pm, and Sat-Sun until 9pm. This museum will be open on all holiday dates, including Christmas and New Years! 13€ includes audioguide. No advance booking required. 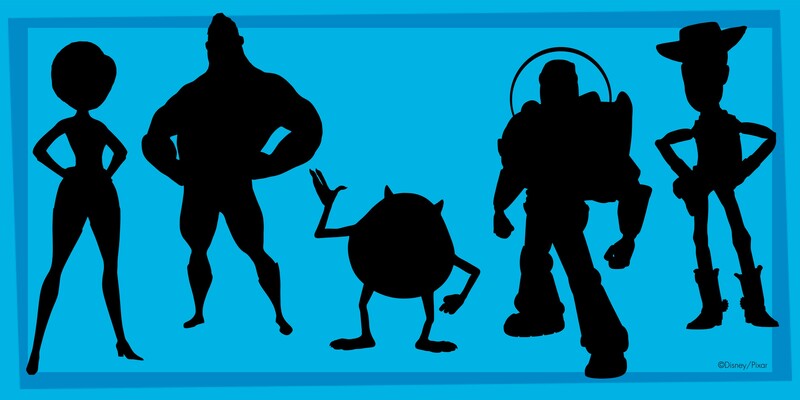 Pixar: 30 years of animation - "over 400 drawings, sculptures, sketches, collages and storyboards and a huge selection of video material." This exhibit will be open on all holiday dates, including Christmas and New Years! In December 2018, catch the opera in Rome, including Puccini's Tosca, Giuseppe Verdi's Rigoletto, and Tchaikovsky's Swan Lake. 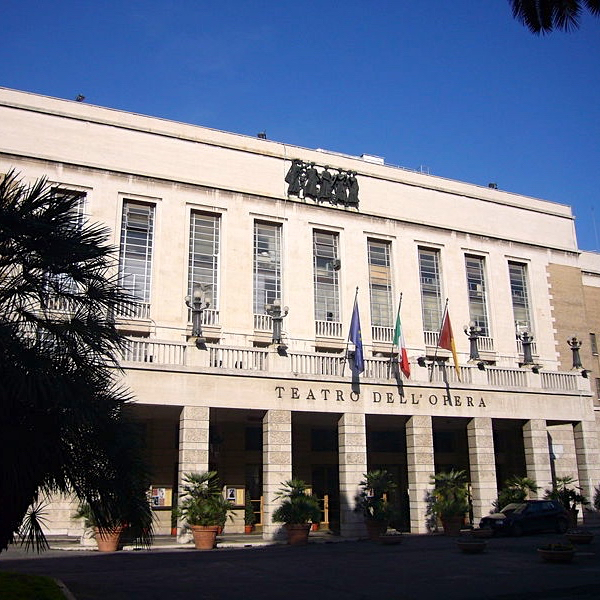 Some shows are in Rome's beautiful Teatro dell'Opera (Opera House), and others are at their other official venues around Rome. 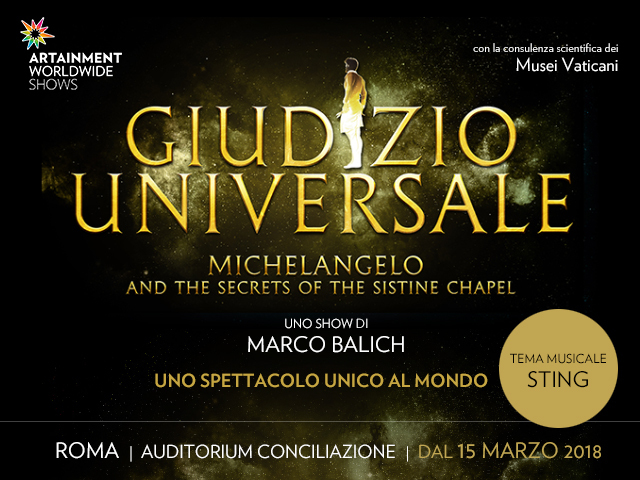 Click here to find tickets at Teatro dell'Opera. I attended the opening of this show and it's incredible! A unique mix of immersion theater, with live actors, ballet, modern dance, original music by Sting, and more. I cannot recommend this enough, especially if you are as big a fan of Michelangelo as I am. Scuderie del Quirinale, Via XXIV Maggio. 10€ full price (click the photo to visit this site). 15€ full entry fee. Buy tickets here. Mon - Thu 10am - 8pm; Fri - Sat 10am - 11pm; Sun 10am - 9pm. Exciting news for lovers of Ancient Rome! From November 11, 2018 - January 6, 2019, you can visit the gorgeous Ara Pacis at night. Because this amazing ruin is housed inside an almost all-glass museum that was especially designed for it, you will really get the full impact by seeing it lit up, with the night sky around you outside. And, now you can also view the monument with virtual reality goggles, making it an even more sensory experience. The museum is accessible and wheelchair facilities are available for people with walking difficulties. Buy your tickets to the Ara Pacis here. Christmas lights on Rome's via del Corso in 2013/2014. These were my favorite so far! Until only a few years ago, lighting up streets, homes and buildings was a small part of a Christmas tradition in Italy. And Christmas trees, which are originally a Northern European tradition, only started being a thing in Rome and in Italy the past few decades. Christmas tree in front of the Complesso Vittoriano in Piazza Vittorio - the decorations and type of tree change very year, and this one was particularly beautiful! Now, Rome at Christmas is awash in lights and decorations. Certainly just walking around the city center is a fun thing to do during the holidays in Rome. The best streets/areas include the area around the Spanish Steps, via del Corso, via dei Coronari, Trastevere, and Piazza Navona, even with a diminished Christmas Market there. Take a half day Rome tour and see the lights! Why not combine a Rome walking tour with a chance to see the best of Rome Christmas decorations? Book a tour here with Viator (in US$) or with GetYourGuide (other currencies). For a really special tour, try this one that focuses on Angels and Nativity Scenes. Is Rome Crowded in Rome at Christmas? Mostly Rome is not very crowded just up to Christmas and on Christmas. So for the dates leading up to Christmas you should be able to find inexpensive accommodations in Rome, but from the 26th, expect rates to go up. 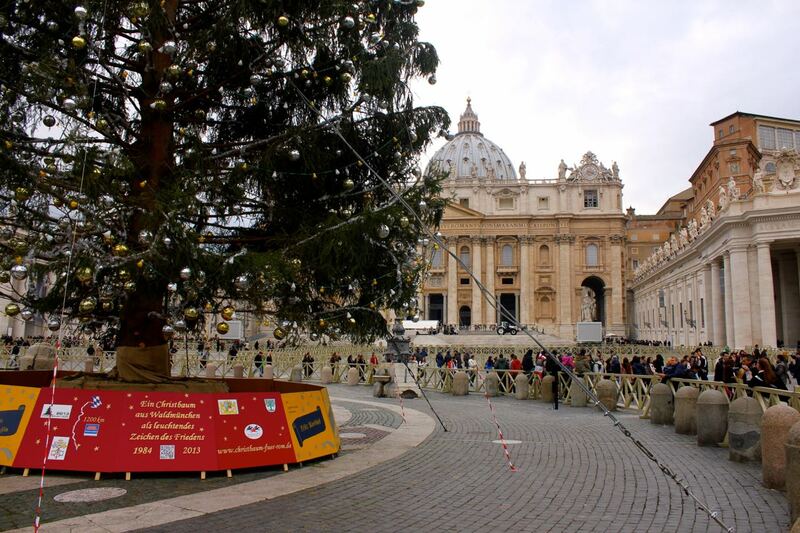 When do they light the tree in Vatican Square in Rome at Christmas? The Christmas tree in Vatican Square is without a doubt one of the most popular of the Christmas trees in Rome. A relatively new phenomenon, started in 1982 during the pontificate of Pope John Paul II, the tree is lit up in the afternoon sometime around December 8. There is also an enormous life-sized nativity scene in the square, in addition to the one inside St. Peter's basilica. The nativity scene and Christmas tree in Vatican square will be lit on December 7, 2018 at 4:30pm. They will stay lit through January 13, 2019. The main Rome Christmas market we ONCE had was at Piazza Navona. It was arguably Rome's biggest and most popular Christmas market and fair. Every year, from sometime in early December until January 6 (Befana), there was a traditional, family-oriented Christmas fair that took up almost all of piazza Navona, as you can see from the photo below. Piazza Navona in Rome at Christmas. This is the fair we used to have before the 2014 scandal! It's now slowly coming back, but with fewer stands than before. The point is that while you will find Piazza Navona festive, with a carousel, nativity scene, some lights, a handful of stands and maybe a tree, it is NOT the huge Christmas Market hub in Rome we once had. The carousel and Nativity Scene (should) still go up every year, even if the market is much smaller. The idea is that Piazza Navona should be about families and children, and less about "commercial" things. In 2016, there were about 6-7 stands, all with carnival-type games where you can win a stuffed animal. That's it. No food, no toys, no crafts, nothing to buy. In 2017, there was supposed to be a Christmas Market, with SOME stands, but it didn't even go up until December 14. In 2018, we are still waiting for news. I suggest going there anyway as it's a beautiful ambiance no matter what! So where are the Christmas Markets in Rome in 2018? The first thing you may want to be aware of, is that Christmas markets are not part of Italian Christmas tradition. They tend to be more common, and much bigger, in northern European countries. We did have a pretty bustling market, Roman-style, in Piazza Navona. Now that it's sort of diminished, there are a few more places in Rome where you can check out Christmas Markets - just don't expect them to be like the one in Piazza Navona, or what you find in northern Europe! There is a vintage/antique market in Piazza Mazzini in Prati on the first and third Sunday of every month. Throughout December the market turns into a fairly large Christmas Fair (it seems to be open daily during this time.) You will find gifts, crafts, food, Christmas decorations and more. 9am - 9pm. Throughout December, head to the funky Mercato Monti, in the Monti neighborhood near the Colosseum. This is a year-round market, normally open mostly on weekends. But during Christmas, they are open on the above dates, daily, and with more of a Christmas feel. Now with 2 floors for twice the fun! 10am - 8pm, via Leonina 46. Throughout December , you can enjoy a small Christmas market with about 30 stands near the Rome Auditorium. Open daily 10am - 10pm, except Christmas Eve when it will close at 2pm. Food trucks, designers, artisans, Christmas food and decorations. You can easily reach this market from Rome center, with the Metro red line A, and then transferring to tram 2. If you are looking for some seriously cute Christmas ornaments and decorations, check out the "Sempre Natale" store in Rome. That means "always Christmas", and it does feel like it inside. The shop is small but well stocked with a great assortment of ornaments. Via della Scrofa 93, not far from Piazza Navona and the Pantheon. Open Thurs - Tues 11am - 9pm. Closed Wednesday. "Sempre Natale" Christmas shop, where it's always Christmas in Rome! Probably one of the oldest Christmas traditions in Italy is the Presepe, or Crèche, or, Nativity Scene. Whatever you call it, you will find them everywhere in Rome at Christmas, and they are amazing. The most popular Nativity Scenes in Rome at Christmas are in the center of Piazza Navona, the one in Vatican Square, the one in Piazza del Popolo and the one in the church of Santa Maria d'Aracoeli, on the Capitoline Hill. But almost every church in Rome (and frankly just about everywhere in Italy) has a presepe during Christmas. Naples is famous for their Nativity Scenes. There is a street I love to visit there, Via San Gregorio Armeno, where the artisans make the figures and figurines for nativity scenes around Italy and the world. These figurines are just incredible, down to the tiniest detail . . . like little wood burning stoves that actually light up; bakers shoving pizza into ovens; and animals that seem alive even though they are only the size of my hand. Speaking of these little figurines for Christmas Nativity Scenes (presepi), you may also want to check out the shop on via dei Coronari, that sells these year-round. So even if you are not in Rome at Christmas, you can get into the "Christmas Market" mood. The figurines are (mostly) not made in Naples, but are made by Italian artisans from different parts of Italy, in particular Tuscany. Items range from Christmas-y to not, and very small to quite large. It's a fun shop and frankly anytime I take visitors there, they seem to buy something! Presepi Pampa. Via dei Coronari 152, open daily 10am - 8pm. As you might expect, the weather in Rome in December is chilly and can be rainy. The days are short which means it gets dark early, and if it's rainy or humid, the air can feel especially cold after the sun goes down. But the good thing is that with a darker afternoon, you can enjoy all the lights even more! And with so many people out and about, there is a pretty warm feeling in the air and it's easy to forget you are cold. A chilly rainy day doesn't stop people from enjoying the Christmas atmosphere in Rome! A good camera that can take pictures in the dark - you will want lots of pictures of the lights and decorations! Want more information about what to pack for Rome? Click here. Want to know what Romans eat in Rome at Christmas? And, where to eat? I have a separate page about this. Go here. It's extremely difficult to get tickets to midnight mass inside the basilica. You might try with any clergy you know, and request tickets many months in advance. If you would like to request tickets to attend a Papal Mass, here's how. But if you can't get tickets to attend midnight mass inside Saint Peter's basilica, take heart. You and many thousands like you, can spend Christmas Eve mass in Saint Peter's square, and catch the service on the giant jumbo-tron screens. It's actually a very festive and warm atmosphere, even if it's not physically warm outside! For more details about dates/times of events, and even to watch them live on the Vatican telecast, go here. Note the times given are for GMT, and Rome is one hour later than that. Midnight Mass at the Pantheon is a special way to celebrate in Rome at Christmas Eve. No tickets are required but if you want to be inside, you should get there early. Mass at the Pantheon begins at midnight on Christmas Eve. Another special place to attend midnight mass on Christmas Eve in Rome is at Santa Maria in Ara Coeli, above Campidoglio. Want to share this page about Rome at Christmas on Pinterest? Pin it here! © 2019 romewise.com - All rights reserved.